The Proverbs of Solomon are intended to help us “know wisdom and instruction,” says the King in Proverbs 1:2-3, and “to understand the words of prudence.” For investors, wisdom means making the right decisions to maximize returns – and that involves keeping cash flowing from rental properties. And Jason Hartman’s theory of relativity shows why – and why it’s best to diversify investments into as many markets as possible. Investors in income property often face an all too common problem: keeping those properties rented. Market conditions vary, rents rise – and a property may end up unrented for some period of time. And that means no income at all. If that income hinges on one relatively high priced property, that means no return for the investment if renters can’t be persuaded to pay the going rent. And if that investor doesn’t have other properties in other markets as a fallback, then the whole investing effort stalls. A better strategy is to diversify – one of Jason Hartman’s first 10 Commandments for Successful Investing. As he points, you can own one house worth around $400,000, and collect one rent per month – a rent that can easily vanish. Or for the same investment, a market-savvy investor could buy four properties at $100,000 each. Buy even lower priced properties, in the $50,000 range, and the number of potential income sources doubles again. And though rents in those lower-priced properties will of course be lower, they’ll be relatively constant. And one – or even more – properties remaining unrented for a short – or even long – period of time will have a much smaller impact on the overall investment. 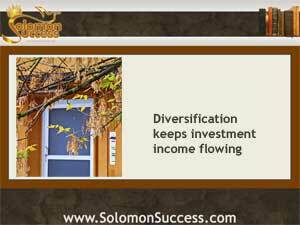 It’s a scenario that keeps cash flowing – and that’s the real goal of investing in income properties. Financing investment properties lets an investor safeguard personal savings while tenant rents cover mortgage payments – which puts the cash into cash flow. And so, strategies that keep properties rented for reasonable market rates will keep income coming in. And those strategies might even include lowering rents in order to prevent a period of vacancy. Lower than market rents on a quality property increases the chances of keeping it rented and allows an investor/landlord to choose from a larger pool of applicants for a reliable, financially stable tenant.